Sectioned off from the gaming floor, but very much an integral part of our casino, diners are treated to some of the most delicious, seasonal food available. From our star attraction steaks and sumptuous Sunday roasts, other popular favourites include Marco’s Roast rump of lamb a la dijonnaise, smoked haddock fishcake with poached egg, and for dessert the Cambridge burnt cream is a light delight. We can cater to all tastes and preferences with our range of menu options, including A La Carte, Lunch, Pre-Theatre, Alea All In, Vegetarian and Vegan. The hardest part is deciding which of our amazing dishes to choose! 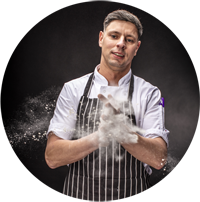 Well versed in signature specials, but equally comfortable with simple, straightforward dishes, Raf brings a wealth of knowledge – and delicious recipes! – to Alea Nottingham. It’s not just about the food though! There are so many more reasons to eat here. We have a fully stocked bar, our attentive staff are second to none, the decor is stylish with wonderful comedic artwork around the walls and daylight pours through from the street windows. Also, unlike other casinos, we allow under 18s into the restaurant – so you can bring the whole family. Customers can even choose their own steak knives and we’re able to tailor meals to any vegetarian, allergy or intolerance requirements.